Glitchtown » Archive » Marwho? Brief detour from the current storyline today. Little do people know that Glitchtown is actually sponsored by Adobe. Ok, no it’s not. Obviously. They probably hate me. 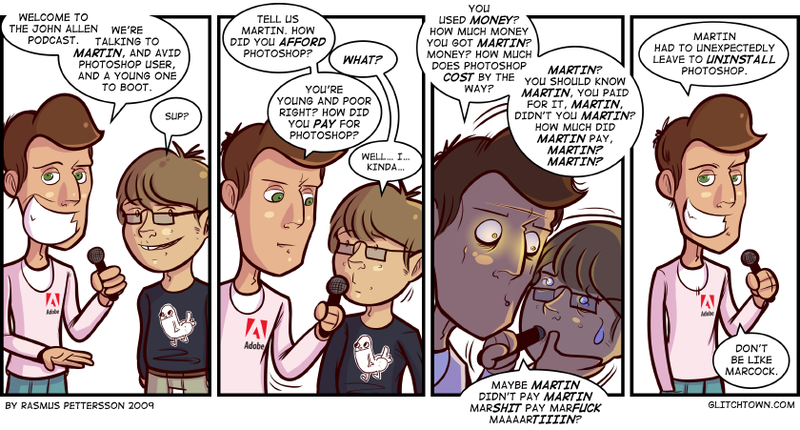 Dickbutt looks copy and pasted into Martin’s shirt. He’s not. Adding a white storke kinda made it look like he is though. Sponsor KC Green and get one of those shirts today. This entry was posted on Friday, July 24th, 2009 at 6:00 am and is filed under Comic. You can follow any responses to this entry through the RSS 2.0 feed. Both comments and pings are currently closed. Seriously, I don’t think I know ANYONE who has ever bought PhotoShop. I’m sure Adobe acknowledges this. Glad I have a 100% legitimate copy of Photoshop…100% totally legitimate not downloaded and cracked copy of Photoshop. I can think of a few, Chris… or, well, ok. No private persons though. But I guess I don’t “hang” with those kind of people. I hang with damn dirty pirates. Sure, Mike. And I’m the king of Sweden. That’s funny… that’s the number to MY lawyer TOO! Coincidence? I never downloaded it. Never ever ever. Mine is just as legit as Mike’s. I call cookies on all of you! My readers are a bunch of liars! D: Unlike… hrrm, me… I totally paid for photoshop. Yes… with money. Oh, PLEASE Danny. Those pic are so OBVIOUSLY shopped in your illegal copy of PS! Åh fan. Engström i egen hög person, hur hittade du hit? 😀 HOW DID YOU FIND ME?! Isn’t there a form of currency called “an alex” that is the amount of money it costs to buy photoshop? As funny as it sounds, piracy seems to be one of the best things to happen to photoshop. Since it was so easy to get a pirated copy, students and hobbyist were able to use it. When they got paying contracts, they tended to pay for a license. If not, they have no money to go after anyways. IMHO piracy elevated photoshop to the level of being a verb instead of just a peice of convoluted, expensive, print publishing software. This comic is obviously ‘shopped. Amen to that, thatguy. Couldn’t agree more. Sometimes I even think that Adobe acknowledge that, and encourages piracy to some extent (especially when they accidentally made it so the fullversion of PSCS4 could be downloaded from adobe.com). They probably don’t though… but without illegal copies of it, we wouldn’t have all these incredibly talented people popping up everywhere that will probably end up working with a legit copy later on. Heh, kinda repeated what you just said… anyway, I agree.